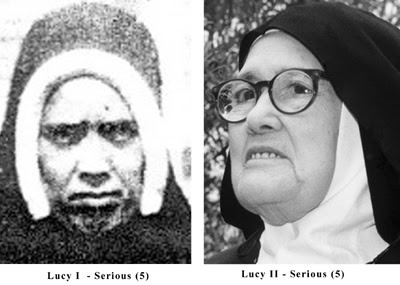 TradCatKnight: "Sister Lucia's" Affirmation of the Vatican's NewThird Secret: Does the Whole Sister Lucy Mystery Come Down to the Third Secret? "Sister Lucia's" Affirmation of the Vatican's NewThird Secret: Does the Whole Sister Lucy Mystery Come Down to the Third Secret? The entire Falsification of the Third Secret depends for its plausibility on the identity of Sister Lucy. Lest we forget what is at stake, here is a "conversation" with "Sister Lucy"in which she endorses everything coming from the Vatican with regard to the Third Secret. In the "interview" below, "Sister Lucy" explicitly affirms the Vatican's "Third Secret." Surely the finding out the truth about Sister Lucy's identity is much more important than the endless speculation about the "Fourth Secret"? From the Vatican, 19 April 2000. The meeting between Sister Lucia, Archbishop Tarcisio Bertone, Secretary of the Congregation for the Doctrine of the Faith, sent by the Holy Father, and Bishop Serafim de Sousa Ferreira e Silva, Bishop of Leiria-Fatima, took place on Thursday, 27 April 2000, in the Carmel of Saint Teresa in Coimbra. Sister Lucia was lucid and at ease; she was very happy that the Holy Father was going to Fatima for the Beatification of Francisco and Jacinta, something she had looked forward to for a long time. The Bishop of Leiria-Fatima read the autograph letter of the Holy Father, which explained the reasons for the visit. Sister Lucia felt honoured by this and reread the letter herself, contemplating it in own her hands. She said that she was prepared to answer all questions frankly. At this point, Archbishop Bertone presented two envelopes to her: the first containing the second, which held the third part of the “secret” of Fatima. Immediately, touching it with her fingers, she said: “This is my letter”, and then while reading it: “This is my writing”. The original text, in Portuguese, was read and interpreted with the help of the Bishop of Leiria-Fatima. Sister Lucia agreed with the interpretation that the third part of the “secret” was a prophetic vision, similar to those in sacred history. She repeated her conviction that the vision of Fatima concerns above all the struggle of atheistic Communism against the Church and against Christians, and describes the terrible sufferings of the victims of the faith in the twentieth century. When asked: “Is the principal figure in the vision the Pope?”, Sister Lucia replied at once that it was. She recalled that the three children were very sad about the suffering of the Pope, and that Jacinta kept saying: “Coitadinho do Santo Padre, tenho muita pena dos pecadores!”(“Poor Holy Father, I am very sad for sinners!”). Sister Lucia continued: “We did not know the name of the Pope; Our Lady did not tell us the name of the Pope; we did not know whether it was Benedict XV or Pius XII or Paul VI or John Paul II; but it was the Pope who was suffering and that made us suffer too”. As regards the passage about the Bishop dressed in white, that is, the Holy Father—as the children immediately realized during the “vision”—who is struck dead and falls to the ground, Sister Lucia was in full agreement with the Pope's claim that “it was a mother's hand that guided the bullet's path and in his throes the Pope halted at the threshold of death” (Pope John Paul II, Meditation from the Policlinico Gemelli to the Italian Bishops, 13 May 1994). Before giving the sealed envelope containing the third part of the “secret” to the then Bishop of Leiria-Fatima, Sister Lucia wrote on the outside envelope that it could be opened only after 1960, either by the Patriarch of Lisbon or the Bishop of Leiria. Archbishop Bertone therefore asked: “Why only after 1960? Was it Our Lady who fixed that date?” Sister Lucia replied: “It was not Our Lady. I fixed the date because I had the intuition that before 1960 it would not be understood, but that only later would it be understood. Now it can be better understood. I wrote down what I saw; however it was not for me to interpret it, but for the Pope. Finally, mention was made of the unpublished manuscript which Sister Lucia has prepared as a reply to the many letters that come from Marian devotees and from pilgrims. The work is called Os apelos da Mensagem de Fatima, and it gathers together in the style of catechesis and exhortation thoughts and reflections which express Sister Lucia's feelings and her clear and unaffected spirituality. She was asked if she would be happy to have it published, and she replied: “If the Holy Father agrees, then I am happy, otherwise I obey whatever the Holy Father decides”. Sister Lucia wants to present the text for ecclesiastical approval, and she hopes that what she has written will help to guide men and women of good will along the path that leads to God, the final goal of every human longing.The conversation ends with an exchange of rosaries. Sister Lucia is given a rosary sent by the Holy Father, and she in turn offers a number of rosaries made by herself. The meeting concludes with the blessing imparted in the name of the Holy Father. Sister Lucia II of the Bertone can not possibly be the the Sister Lucia of the 1957 interview with Fr Fuentes. It is true the little Jacinta spoke much of the suffering Holy Father. If Cardinal Siri was the hostage pope from 1963 until his death in 1986 - it might even have been him. It might be Pope Benedict. Conceivably the 'suffering Holy Father' is a term that might apply to more than 1 pope. So even Fake Lucia said it should be kept secret till 1960? After the real Sr. Lucia disappeared from the world's eyes (i.e., after 1959, whether she was killed or just silenced is still to be determined) the Freemasonic-dominated Vatican had the Fake Sr. Lucia speak of the 1960 date because the entire Fatima-following Catholic world knew for sure that the real Sr. Lucia had made known that date. Pius XII was sent the 3rd Secret in the late 1950s, as the 1960 date was approaching. So the FAKE story that we got in 2000 was compelled to have their FAKE Sr. Lucia espouse the 1960 date announced earlier by the real Sr. Lucia. And most assuredly that whole "interview" from 2000 was completely fabricated -- and the narrative is complete fiction. The fake Sr. Lucia was an actress in one way or another, and she may not have even really been a religious. Hence, anything she "said" was scripted; the Freemason Bertone (or another Vatican Freemason) concocted the whole spectacle as disinformation. The fake Sr. Lucia was only a puppet acting in a role, and if she said anything, it was scripted for her. All of this complexity and difficulty! Two of the secrets of Fatima were published and they were succinct, clear and falsifiable. It is evident when they were fulfilled. The Third Secret will have the same style because it is our Lady's style. She wants her message to be clear to everyone. The Third Secret, a transcript of our Lady's words will be the one written on a single sheet of paper. It will be brief, it will clear. And it will be devastating to the architects and executioners of the Great Apostasy. That is why they have multiplied complexities and interpretations and secrets and obscurities. In your first paragraph do you mean that the first 2 secrets were "succinct, clear and VERIFIABLE"?? Otherwise, not sure what you mean.